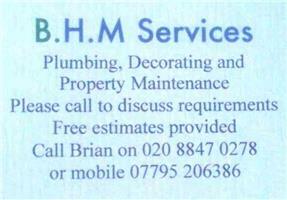 B H M Services - Home Improvements, Plumber based in Isleworth, Middlesex. My name is Brian and I'm a friendly, reliable workman. No job is too small and my skills include domestic plumbing (i.e bathroom taps leaks), decorating, fencing, decking and not forgetting general house and business property maintenance. Please call me for a free quote - no obligations.